Firstly I'd like to wish you all a Happy and Prosperous New Year and thanks for following and commenting on my weird and complex taste in music!! Of Monsters and Men are a five-piece indie folk/indie pop band from Iceland, formed in 2010. The members are co-singer/guitarist Nanna Bryndís Hilmarsdóttir, co-singer/guitarist Ragnar "Raggi" Þórhallsson, guitarist Brynjar Leifsson, drummer Arnar Rósenkranz Hilmarsson,and bassist Kristján Páll Kristjánsson. Try saying them names after a few beers! The band won the Músíktilraunir in 2010, an annual battle of the bands competition in Iceland. 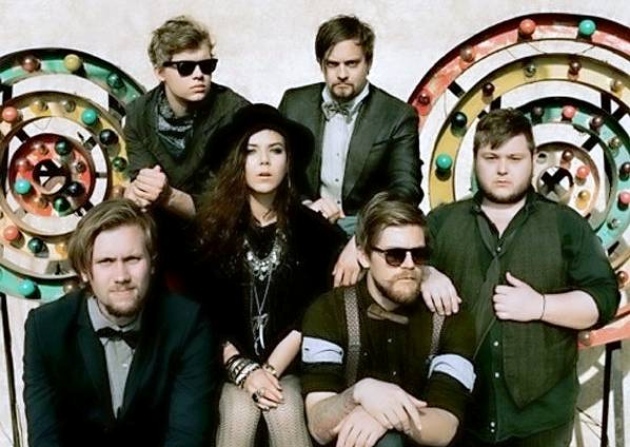 In 2011, Of Monsters and Men released an EP entitled Into the Woods. The band's debut album My Head Is an Animal (2011), peaked at No. 6 on the US album chart and No 3 here in the UK. Its lead single "Little Talks" was an international success, reaching No 12 in the UK and No 31 in the US, but it did make it the No1 spot the US Alternative Songs Chart and in their homeland. Unfortunately the follow up “Mountain Song only reached UK No 66 and US 106!! I think it’s the better of the two to be honest, but hey that’s me! I couldn’t find an official video for the song, but I’ve included a live version as well, which is just as good if not better than the studio version. I definetly prefer the Mountain Sound song too! Hey that's us after all!